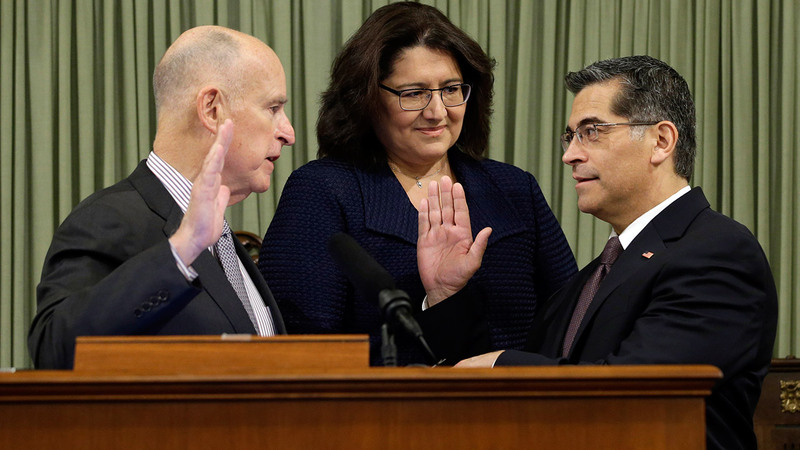 SACRAMENTO -- Xavier Becerra has been sworn in as California's attorney general in Sacramento on Tuesday, becoming the first Latino to serve as the state's top lawyer and law enforcement official. The 58-year-old Democrat from Los Angeles succeeds Kamala Harris, who was elected to the U.S. Senate as the successor of outgoing Democratic senator Barbara Boxer. He will serve the final two years of Harris' term. Becerra has served in the U.S. House of Representatives since 1993 and won his 13th consecutive term in November. Becerra has stepped down from Congress and a special election will be held to fill his seat. Prior to his election to Congress, Becerra served as representative for the 59th Assembly District in Los Angeles County for the California State Assembly from 1990 to 1992. The son of working-class immigrants from Jalisco, Mexico, Becerra was born and raised in Sacramento. He graduated from Stanford University, becoming the first in his family to obtain a four-year degree. Becerra is married to Dr. Carolina Reyes and they have three daughters.